Fucked Up Inside is the first live album ever issued by Spiritualized, it was originally released as a limited edition (1,000) mail order only LP in 1993. Recorded on tour in 1992 while supporting Spritualized’s debut release Lazer Guided Melodies this is the first album to document the power of the band live and has long been an out of print collector’s item since it’s initial release. Includes three songs from Lazer Guided Melodies, two from the future Spiritualized album Pure Phase, plus the Spacemen 3 favourite Walking With Jesus. The live recordings come from the Crest Theatre in San Diego and the Hollywood Palladium in L.A. on the nights of 19th and 21st November 1992 on the North American Rollercoaster tour with the Jesus and Mary Chain and Curve. Yeah! Re-mastered by John Rivers at Woodbine Studios especially for vinyl release. This is a milky clear coloured heavyweight 180 gram vinyl LP in an embossed and hot foil finished sleeve. Spacemen 3 heads should also check out the ‘Taking Drugs To Make Music..’ coloured vinyl and the Spectrum Record Store Day other releases..
Spiritualized – 06 – Shine A Light (Clear Light/Clear Rush) [live]. From the 1993 live and now out of print album Fucked Up Inside. It was originally available only via mail order, now reissued for Record Store Day 2018. 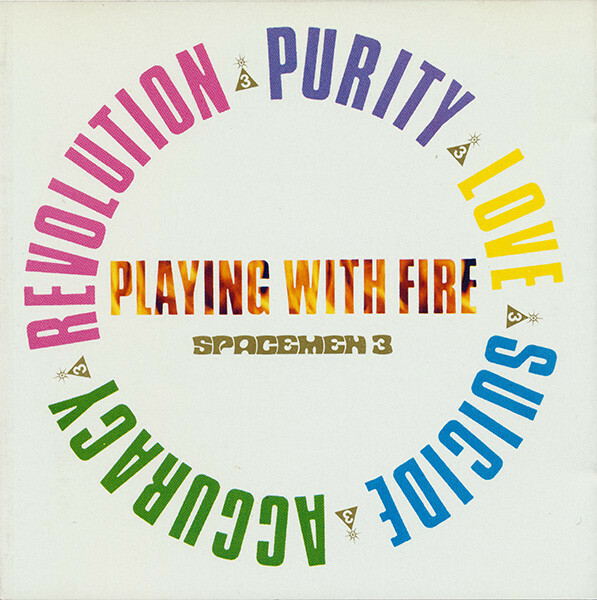 Originally released in February 1989 and after having been out of print on vinyl for nearly 20 years Space Age Recordings are pleased to announce an official limited edition vinyl release of the third and penultimate studio album “Playing with Fire” by Spacemen 3 (Sonic Boom a.ka. Peter Kember (Spectrum / E.A.R.) and Jason Pierce (Spiritualized). Featuring the single “Revolution” first released in November 1988: “one of the best records released by an independent band this year. Adjectives that come to mind are unrelenting, punishing, psychedelic. The razor-blade riffs lead you into a sonic underworld of alienation, desolation and raw power…the band are one of the most interesting around,“a powerful, anthemic “mind-melting crunch”. Presented in a shrink-wrapped limited edition (1,000 copies only) on heavyweight (180 gram) transparent orange coloured vinyl with printed card inner sleeve exclusively released for Record Store Day 2017. Space Age Recordings are pleased to announce the first official limited edition vinyl release of the album “For All The Fucked Children Of This World We Give You Spacemen 3” (Sonic Boom a.ka. Peter Kember (Spectrum / E.A.R.) and Jason Pierce (Spiritualized).“For All the Fucked Up Children” from the neo-psychedelic trio Spacemen 3 was first released as a bootleg record in 1995. The record consists of Spacemen 3’s first ever recording session from 1984. Space Age Recordings are pleased to announce an official limited edition vinyl release of the fourth and final Spacemen 3 studio album “Recurring”; the follow up to their seminal “Playing with Fire” album. By the time the album was recorded, relations between the band had soured to the extent that the record is essentially in two parts; the first five tracks on side ‘A’ written and performed by Sonic Boom a.ka. Peter Kember (Spectrum / E.A.R. ), and the last five tracks on side ‘B’ written and performed by Jason Pierce (Spiritualized). The lead track from the album “Big City” recently featured on the season 27 premiere of ‘The Simpsons’ being the sound track to Homer Simpson’s wild night out on the town, mixing alcohol with prescription drugs. Presented in a shrink-wrapped limited edition (1,000 copies only) on heavyweight (180 gram) solid red coloured vinyl with printed card inner sleeve exclusively released for Record Store Day 2017. 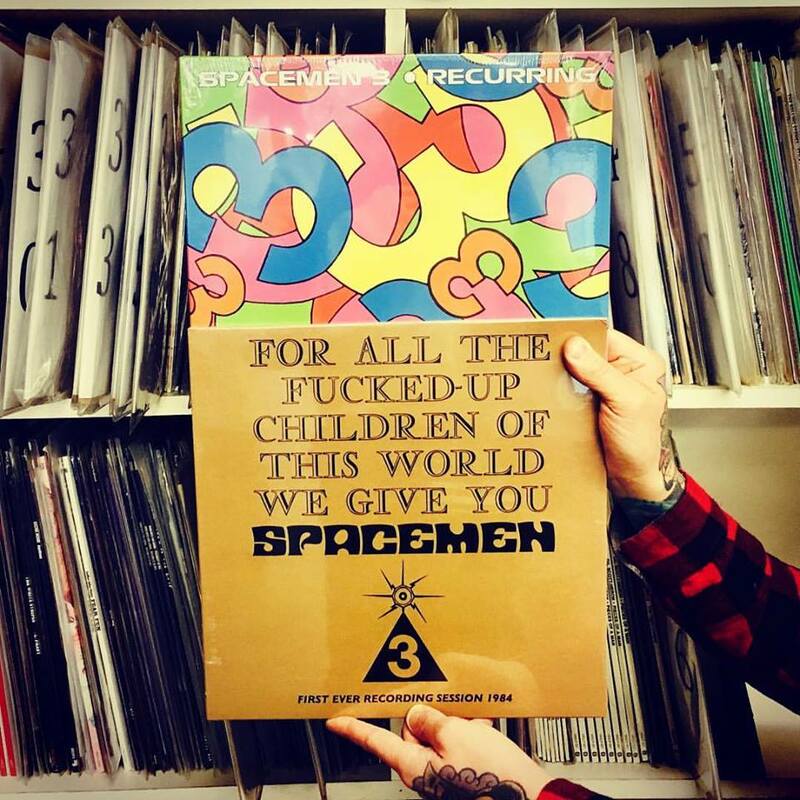 Jason Pierce has urged his fans NOT to buy Spacemen 3 albums on Saturday’s (22nd) Record Store Day event. The band, formed by Pierce and Pete Kember, earned a cult following during the 80’s with iconic records like “For All the Fucked Up Children of This World We Give You Spacemen 3″, “Sound of Confusion” and “Taking Drugs to Make Music to Take Drugs To”. A falling out between Kember and Pierce resulted in the band splitting in 1991 and, as Record Store Day prepares to release three Spaceman 3 vinyls on Saturday, Pierce posted on his Spiritualized Facebook page to explain how a legal battle with former manager Gerald Palmer is resulting in a conflict of interests. “We would seriously like to ask fans not to buy the Spacemen 3 releases and any merchandise that are being offered for sale on Record Store Day or any of the other Spacemen 3 releases and merchandise offered by Gerald Palmer on Space Age Recordings or any other subsidiary of that label, the statement read. “We are currently in legal dispute with Gerald Palmer due to him depriving us of our rights in our music and other intellectual property rights relating to Spacemen 3. Any monies from those sales will go directly to him and help fund his side of the dispute.